We're sorry to say David won't be able to be here this weekend. We look forward to learning and fighting with (alongside, that is) y'all soon! Please spread the word through your networks that this has been canceled. On the Unceded Territories of the xʷməθkwəy̓əm (Musqueam), Skwxwú7mesh (Squamish), Stó:lō and Səl̓ílwətaʔ/Selilwitulh (Tsleil-Waututh) Nations. Join Rising Tide - Vancouver, Coast Salish Territories and Rising Tide Portland organizer David Osborn as he presents on and discusses the ongoing anti-Megaload actions happening in OR and WA. We will gather to hear and share strategies for shutting down destructive infrastructure EVERYWHERE. What is a megaload? A megaload is a truckload so gigantic that when hauled by a rig and trailer it takes up both lanes of a two-lane highway and can’t fit under a freeway bridge. Megaloads are how enormous Tar-Sands project infrastructure are transported from where they are made to where they are used- used, of course, to destroy the land on ever-increasing Tar-Sands sites. Rising Tide Portland and many grassroots organizers are doing everything they can to hit the perpetrators of climate injustice where it hurts. With 19 arrests, mass disruptive action and a law-suit currently in the works, this struggle against megaloads is an inspiring and important reminder of what we are capable of, the power of state repression, and the necessity to build and maintain cross-'border' solidarity against climate injustice. The Dogwood Centre has one ground floor entrance followed by 6 stairs with a railing to the kitchen and common room level. There is one exterior entrance to the common room which has 3 stairs but will be equipped with a wheelchair ramp. The doorways are 38 inches in width. There are two gender neutral washrooms in the space, one of which is on the ground floor. the door to the main meeting room washroom is 30 inches across and there is a handrail above the toilet. 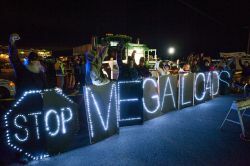 For more information on the megaload resistance efforts find Rising Tide Portland on facebook and check out a few of the related news stories.